I recently had a date at the ballet with four ballet choreographic masters: Alexei Ratmansky, Jerome Robbins, George Balanchine and Justin Peck. It was ballet at its most simple and pure, danced with the incredible heart and passion of the Paris Opéra Ballet ensemble, at the always spectacular Palais Garnier. The simple staging of each piece split the focus equally between the dancers and the musicians, reminding us all of the special partnership between music and dance. 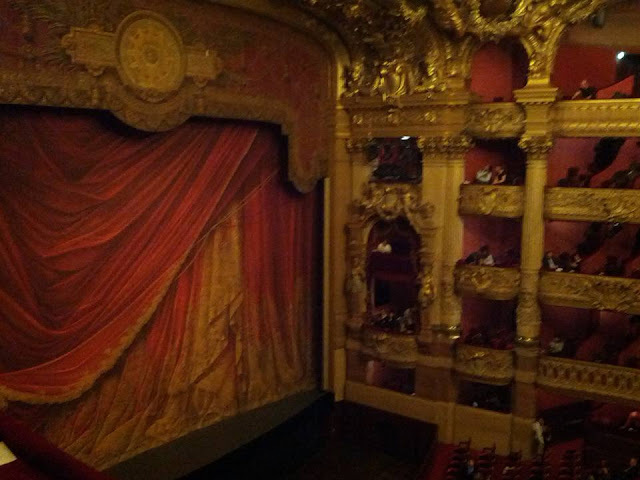 The orchestra pit was empty at Palais Garnier because the music was all onstage with the dance. Russia-born Alexei Ratmansky is currently the Artist in Residence at The American Ballet Theatre in New York City. A dancer with The Ukrainian National Ballet, The Royal Winnipeg Ballet and The Royal Danish Ballet, Ratmansky the choreographer is well-known for his original works and for successfully “restaging traditionally classical ballets for large companies”. He is the master behind the 2011 production of Romeo and Juliet for The National Ballet of Canada and his most recent big production was the February 2016 restaging of Petipa/Ivanov’s Swan Lake in Zurich, Switzerland. His original piece Seven Sonatas premiered at ABT in 2009 and is new to the Paris Opéra Ballet’s repertoire this season. Accompanied onstage by a stirring rendition of Domenico Scarlatti piano sonatas, it was the most complex structurally of the evening. The ensemble of six dancers, three males, three females, alternated between full cast, solo, duet and trio variations as they flitted effortlessly across the stage. Donning simple, ethereal white costumes, the dancers – especially the ladies – seemed to float as though dancing above the stage, their feet barely audible, their lines endless, their arms lithe and flowing. It was a gorgeous ballet to start the evening and I’m sure it will continue to delight Paris audiences for many years to come. Having been a fan of Jerome Robbins’ choreography since the first time I saw West Side Story, I was really excited to finally see one of his ballets. A five-time Tony Award Winner, two-time Academy Award Winner (Best Director and Best Choreography 1961, West Side Story), former Artistic Associate and Ballet Master of The New York City Ballet, his style is one that blends musicality with intricate, lightning-fast footwork. Other Dances premiered at NYCB in 1976 by dancers Natalia Makarova and Mikhail Baryshinkov and has been in POB’s repertoire since 1999. It was a simple, yet lively duet between dancers Ludmila Pagilero and Mathias Heymann, set to the piano music of Frederic Chopin. It had a springtime, folk-dance flavour, complete with simple, lavender costumes and a soft, dreamy lighting design. The dancers flirted and wooed each other in that joyous, playful Robbins’ flair. It had none of the drama of West Side Story, but it showed off the classical side of Robbins’ choreography, of which I’m definitely eager to see more. George Balanchine is often referred to as the “father of American ballet”. Born in Russia, where he trained with the Imperial Ballet School, his choreographic “neo-classical” style blends ballet technique with Broadway and Hollywood dance influences. He is the founder of the School of American Ballet and the New York City Ballet, he had a long-time collaboration with composer Igor Stravinsky and created the majority of NYCB’s repertoire, which is still taught and performed to this day. Duo Concertant is a romantic double-duet between two dancers and two musicians who each take turns showcasing and acknowledging each other’s’ talents. The dance has a lovely sense of spontaneity, as though the dancers are hearing the music for the first time and letting it inspire their every movement. The lighting design also interacts with the dancers, mimicking the moonlight and highlighting different aspects of the dancers’ bodies, giving the whole piece a sense of mystery and intrigue. It was my favorite piece of the evening because of its simple beauty and the way the dance and music played off each other. Plus getting to see Balanchine’s choreography in Paris? A huge check off my Ballet Bucket-List. The most contemporary piece of the night was saved for last and Justin Peck’s dynamic In Creases did not disappoint. It reflected the youth and energy of Peck himself, being the youngest of the featured choreographers and currently the Resident Choreographer of the New York City Ballet. He choreographed his first ballet in 2008 and his star has risen steadily as “he’s since created over 25 new works” for ballet companies across the US; the two most recent being The Most Incredible Thing and In the Countenance of Kings for NYCB and San Francisco Ballet, respectively. In Creases, in its’ Paris Opéra Ballet premiere, was the most athletic and aesthetically different piece of the evening. Fast-paced and electric, the dancers flew for 12 minutes of jumps and extensions, accompanied by dueling pianos playing Philip Glass. They brought the performance to a rousing, satisfying conclusion. Overall, it was a brilliant evening of dance at its most timeless. It celebrated some of the best choreography of the past and present, and the music that gives dance its heartbeat and soul. The simplicity of the evening was what really struck me. Just a piano, some strings and beautiful choreography – at Palais Garnier, what more could be needed? Rudolph Nureyev’s La Bayadère from December 2015. Anne-Teresa De Keersmaeker from November 2015.